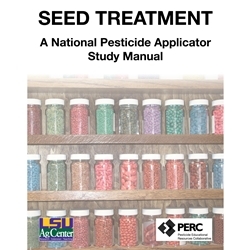 The purpose of this training manual is to provide study material for people interested in becoming a certified pesticide applicator in the seed treatment category in their respective states, Indian tribes, or U.S. territories. It covers the basic knowledge and skills required to safely, effectively and correctly apply pesticides to seeds. Seed treatment is the process of applying pesticides to seeds or plant parts intended to be planted for a new crop (e.g., as food, nursery or greenhouse products, or grass). It does not include pesticides applied to control insects, plant pathogens, or vertebrate pests that attack seed, grain, or commodities while in storage (i.e., a stored commodity). Check with the regulatory agency in your state, Indian tribe, or U.S. territory for pesticide applicator certification requirements for stored commodities. This manual was prepared by Betsy Buffington, Dana Beegle, and Craig Lindholm with support provided by the National Association of State Departments of Agriculture Research Foundation (NASDARF) and the United States Environmental Protection Agency (EPA), Office of Pesticide Programs. Significant credit is extended to Iowa State University and Virginia Tech University for permission to use much of their seed treatment study manuals. Also University of Wisconsin and Washington State University manuals were used to develop the framework document for this study guide.